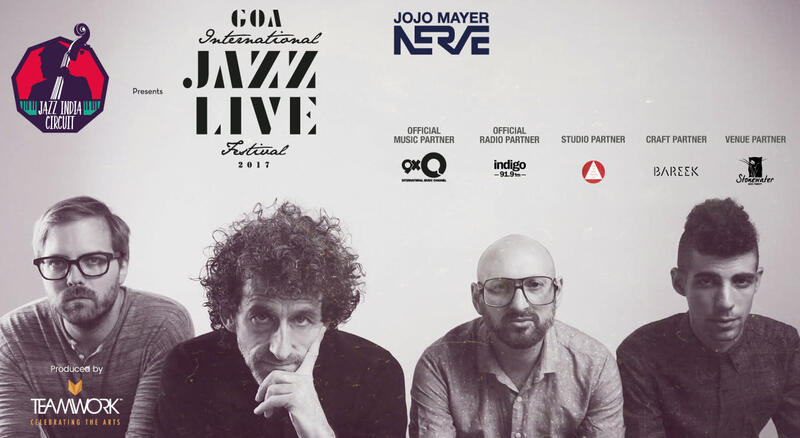 Spicing up Goa’s music landscape, the annual Goa International Jazz Live Festival (GIJLF) is an experimental and funky celebration of contemporary jazz and part of Teamwork Arts’ continued celebration of jazz under the Jazz India Circuit. The 2017 edition of the Festival, to be held in December, will sparkle with six international acts headlined by legendary drummer Jojo Mayer, and renowned French trumpeter Erik Truffaz collaborating with Riatsu. Also on the roster are India’s finest jazz bands including The Latination along with some fantastic international talent such as Pol Belardi’s Urban Voyage from Luxembourg, Kefaya from the UK, the Florian Favre Trio from Switzerland. Come enjoy a special experience at the festival as a festival delegate. You will be looked after in the style of classic old world hospitality: from the time you arrive until you leave. Listed by the Modern Drummer Magazine as one of the ‘50 Greatest Drummers of All Time’, Jojo Mayer toured with Monty Alexander and backed up jazz legends such as Dizzy Gillespie and Nina Simone when he was only 18. NERVE evolved out of Jojo’s legendary party event Prohibited Beatz in NYC during the late 90s. Initially a platform for experimental interaction, the collective eventually developed into a fine-tuned group that cross-pollinated premeditated formats with real time-improvised music performances, bringing in jazz traditions of innovation to the digital age. Swiss-born trumpet player Erik Truffaz has gained prominence in the international jazz community for fusing the post-beebop and early fusion styles of trumpet legend Miles Davis with more contemporary forms of music such as electronica, acid rock, and hip-hop. The result is a musical synthesis that is often nostalgic yet simultaneously fresh, inspiring listeners to hit the dance floor. Riatsu (a recording name of Shadaab Kadri) is an ambient electronic musician from Mumbai, India. With his drone metal band Pangea, Riatsu explores soundtrack music and background scores for visual imagination in a sea of sound that stretches from ambient techno to dark ambient. Kefaya’s music has been described in a multitude of ways: ‘internationalist music’, ‘guerrilla jazz’, ‘contemporary world- fusion’ and ‘global protest music’. The band, however, truly escapes definition. An eclectic group of immigrants, travellers and international artistes, Kefaya seeks to find the common ground between folk traditions of the world and cutting-edge sound rooted firmly in the 21st century. Kefaya’s versatility and wide knowledge of musical traditions have led to collaborations with internationally acclaimed artistes, including legendary Indian vocalist, Shankar Mahadevan. The Latination is one of the only virtuoso and genuine Latin-jazz bands in India. The quartet is a powerful and soulful international collaboration between French and Indian specialists of jazz and Latin music. Their repertoire ranges from the festive sounds of salsa and rumba to contemporary jazz, blending the ecstatic power of Afro-Latin rhythms with the intellectual streams of dense harmonies and sophisticated melodies, the discreet sweetness of jazz ballads and Latin boleros with virtuoso improvisation and breath-taking solo performances. The young Swiss pianist Florian Favre and his trio show an amazingly perfect blend of playfulness and accuracy, juvenile verve and serene sovereignty. Winners of the ‘Grand Prize Albert Michiels‘, their performance has been described by the jury report as ‘very delicate to highly intense moments, within the jazz tradition, but always fresh and surprising, with never a dull moment’. Jazz Podium calls them ‘a true high-carat that is not only great fun but also provides a lot of surprises’. Pol Belardi's Urban 5 takes on a groove-driven, exciting blend between jazz, soul, hip-hop and electronic music. Drawing inspiration from jazz giants such as James Brown, J Dilla, D'Angelo or Erykah Badu, Urban 5 are bound to make you move your hips to a colourful set of fresh, thriving original compositions. Thrilling beats and bass lines mingle with subtle harmonies, lyrical melodies and clever lyrics, topped up with the powerful yet sensitive and honest voice of singer Mara Minjoli.